The Majority of the collection was a gift from Edward McCollin’s daughter, Katharine Arnett. The scrapbook was transferred from the Otto E. Albrecht Music Library – University Library, 2010 (2010:39). The collection is organized into two series – University Material and Musical Material. The University Material contains a scrapbook and copies of the University Record. The Musical Material is organized into Published Material, Sheet Music, and Musical Fund; with material arranged alphabetically. Edward Garrett McCollin was a graduate of the University of Pennsylvania and was active in Philadelphia’s musical community. 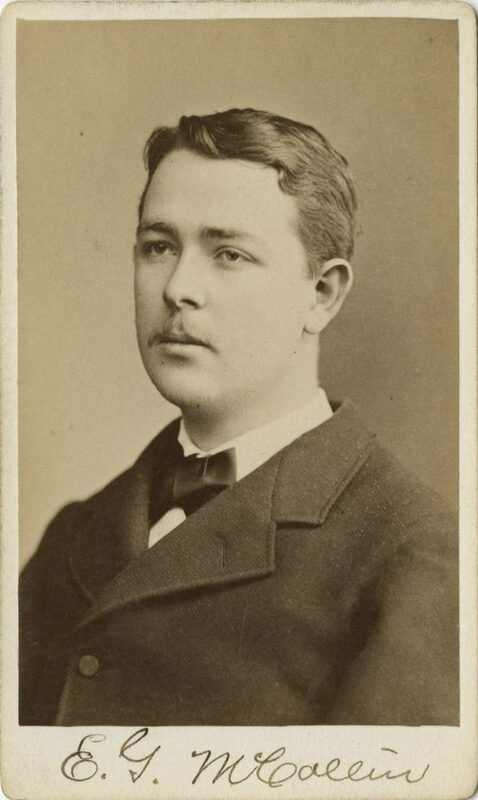 Born on July 6, 1858 in Baltimore, MD, McCollin’s attended the Hastings Academy prior to entering the University of Pennsylvania as a member of the Class of 1878 in the Department of Arts. While at Penn McCollin was a member of Phi Kappa Psi, Philomathean Society, and chief editor of the University Magazine. After receiving his A.B. in 1878 he studied in the Music department for a year prior to entering the Law School. Graduating with his LL.B. in 1880, McCollin began his career as an attorney. Music and the University remained key parts of McCollin’s life. He composed music under his own name or as Garrett Colyn, including “Ben Franklin” and “The Pennsylvania Girl.” In addition to serving as president of the Musical Fund Society, he was a founder of the Philadelphia Orchestra with E. I. Keefer. McCollin was prominent in University Alumni activities and served as president of the College Alumni Society. McCollin died at his Philadelphia home on November 24, 1923. The Edward G. McCollin Collection consists of material related to McCollin’s time as a student at the University of Pennsylvania and a composer in Philadelphia. The University Material contains a scrapbook from his undergraduate years, and copies of the University Record for the years 1878-1881. The Musical Material contains 2 published items, some sheet music by McCollin as well as one score by Frances McCollin and another by Josep Valls, as well as material reated to the Musical Fund Society. Edward Garrett McCollin Memorial Fund. Musical Fund Society of Philadelphia.